So lately I have been attending a meditation course in a centre which is of the Nyingmapa tradition (there are four schools of Tibetan Buddhism, Nyingmapa is the first and oldest of those schools) – a form of Vajrayana Buddhism said to have been introduced to Tibet by Padmasambhava and which includes teachings on Tantra and Dzogchen. Padmasambhava is a giant within this tradition. 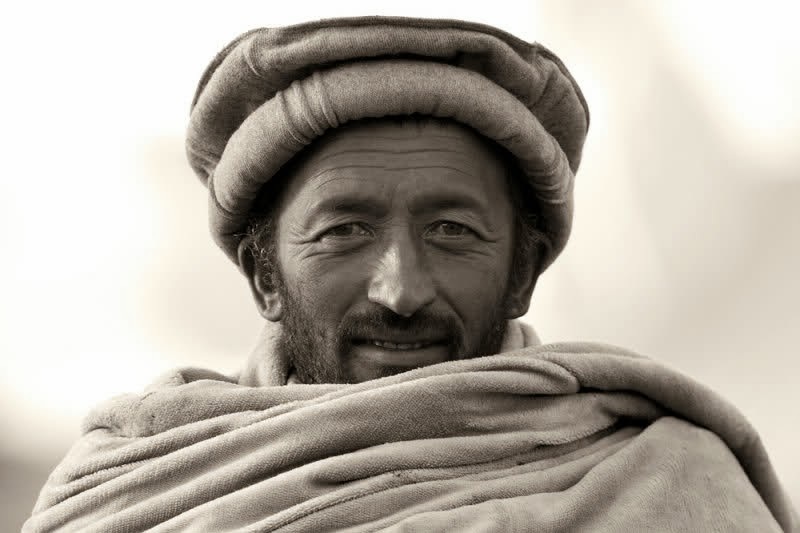 Adherents are encouraged to meditate on his image and to chant his mantra. To say he is revered is an understatement. Although his name is not new to me I have never really felt him coming into my life until now – so … who is he? Padma-sambhava … [focused on] the common ground that existed between Tantric Buddhism and Bon in order to gain acceptance for Buddhism in this new environment. Similarly, Bon shamans were appropriating what they could of the magic and metaphysics of Tantric Buddhism … [Tibetan] Buddhism and Bon grew more and more similar due to apparently uninhibited borrowing on both sides [‘when Padmasambhava introduced Vajrayana into Tibet he did not do away with the ritual practices used by the ancient Bon tradition, but knew just how to use them, incorporating them into the Buddhist Tantric practices’: Chogyal Namkhai Norbu, Dzogchen: The Self-Perfected State at 25]. 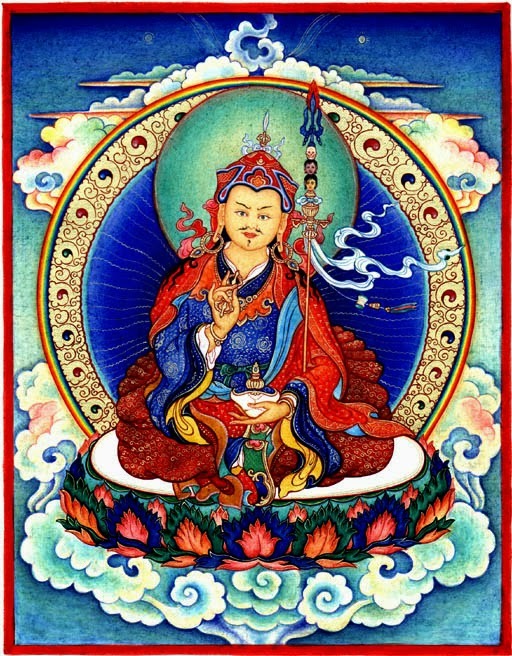 Returning to Padmasambhava – he was said to have been installed as a prince of Oddiyana in his early life and went on to marry a dakini (dakini is a Sanskrit word denoting a female deity or spirit: Lama Lodo, Bardo Teachings: The Way of Death and Rebirth at 67) and rule this kingdom, until, like the Gautama Buddha, he perceived that as a king he would be unable to truly benefit all sentient beings and so he sought to forgo his role as a ruler. He achieved this ends by an unusual means – he is said to have caused the death of the son of a minister in Oddiyana and was thereby banished. This seemingly most unBuddhist of actions was said to be a magical act of mercy, for it enabled the dead child to be reborn in a heavenly realm, instead of a lower realm, where he was on the verge of descending to, being already on the point of death at the time of Padmasambhava’s intervention. After banishment he is said to have roamed over many places, including Bodhgaya in NE India – an important place of pilgrimage for Buddhists, where the Gautama Buddha is said to have reached enlightenment, and a significant Buddhist centre of learning in Padmasambhava’s time (Robert Fisher, Buddhist Art and Architecture at 62). In Bodhgaya Padmasambhava established himself as a Buddhist ascendant and mastered many teachings – he had a number of teachers but one of the most significant of these was a wisdom dakini who manifested in the form of a Buddhist nun (in fact Padmasambhava is said to have been instructed and blessed by a number of dakinis throughout his lifetime – he is also said to have given instruction to dakinis). He then moved to Zahor, in northern India, near Kashmir, where he took the Princess Mandarava as his Tantric consort (in the context of Vajrayana Buddhism this is a position of high esteem). 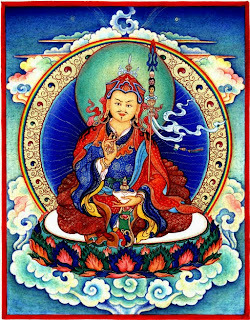 Following this, the king of Zahor arrested Padmasambhava and the princess, however, following a miracle performed by Padmasambhava (transforming a burning pyre into a lake*), had a change of heart and instead became Padmasambhava’s student, as did many others in Zahor. Padmasambhava then returned with Princess Mandarava to Oddiyana, where, following a further miracle (similar to that performed in Zahor), he and Mandarava taught Buddhism for a number of years. 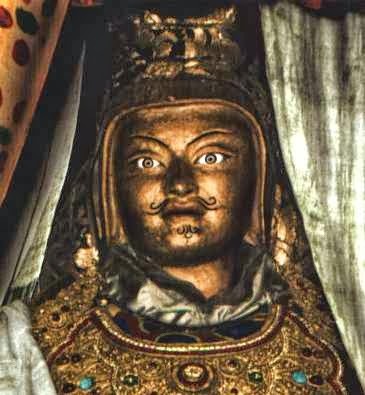 Padmasambhava statue from Samye, Tibet. Padmasambhava subsequently moved onto Nepal, where he took on another Tantric consort – Shakyadevi, a daughter of the king of Nepal. He stayed here for a long period and was the beneficiary of highly advanced Buddhist teachings; after which time he visited many other lands, including Mongolia, China and, of course, Tibet, where he remained for a very long period and became the pre-eminent transmitter of Buddhism – as to which, see above. His consort in Tibet was Yeshe Tsogyal, the principal consort of Padmasambhava and a highly realised master in her own right (Chogyal Namkhai Norbu, Dzogchen: The Self-Perfected State at 64) who was considered to be responsible for transmitting many of his advanced teachings in the form of “terma” (hidden teachings that were gradually revealed to future Nyingmapa masters). In all, Padmasambhava was said to have had five principal Tantric consorts – all of whom were/are held in high esteem by Vajrayana Buddhists. The exact circumstances of his death are unclear, but it said that upon his death he manifested in the pure land of Zangdokpalri – the copper coloured mountain of glory – equivalent to a supreme heavenly realm where he still dwells and will dwell until the end of the universe. * I strongly suspect the burning pyre symbolises anger and other harmful thoughts while the lake represents the coolness and clarity of the Buddha's teachings. Thich Nhat Hanh notes that in "the Lotus Sutra it is said that the Bodhisattva of Compassion can transform the fires that are about to burn us into a cool, clear lotus lake" (Thich Nhat Hanh, The Heart of the Buddha's Teaching at 79). It is possible that Padmasambhava was familiar with this Sutra, which was already hundreds of years old by his lifetime, and deliberately referenced it. These beautiful looking people can perhaps give us an insight as to what Padmasambhava looked like. 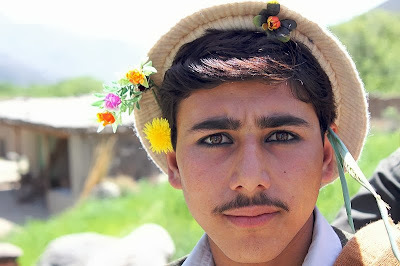 Note that the Swat Valley in NW Pakistan (where Padmasambhava was probably born) is home to a number of ethnic groups, with one of the most common ethnic groups these days being Pashtuns - who are associated with pushing Buddhism out of the region, thus Padmasambhava probably did not look like a Pashtun. However the Dardic people have been in the Swat Valley for thousands of years (eg, see archeolog-home.com; prehist.org and valleyswat.net) so it is possible/probable that Padmasambhava belonged to this ethnic group. Interestingly, the famous "looks like me" statue of Padmasambhava from Samye (above) suggests that Padmasambhava may have had pale irises. 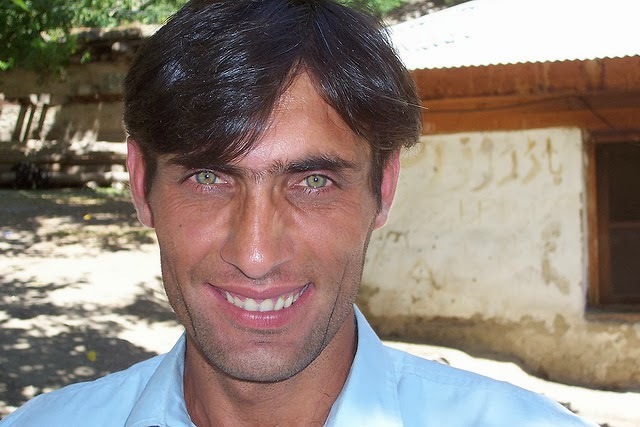 Likewise, many Dardic men today have pale brown, hazel, green or even blue eyes (though dark irises are also very common).